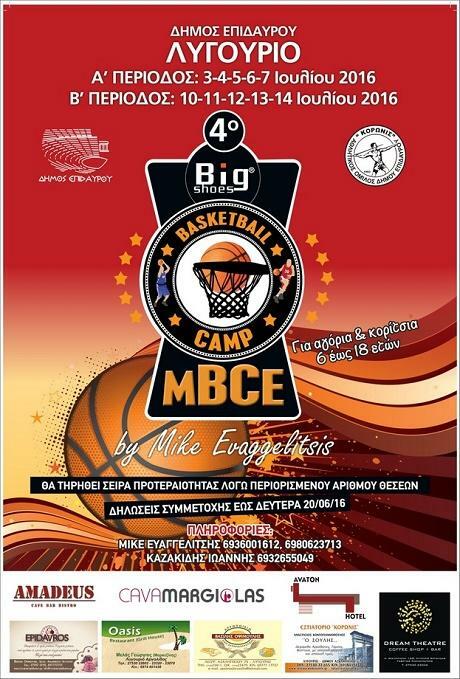 The Municipality of Epidaurus in cooperation with the AO Koronis host the organization of the 4th BASKETBALL CAMP MBCE by MIKE EVAGGELITSIS at Indoor Stadium Ligourio. The Camp will take place in two periods of a) from 3 -7 July and b) from July 10 to 14 and is aimed at boys and girls aged 6-18 years. The young athletes will have the opportunity to learn the secrets of the game from renowned coaches and current and former stars of the sport as Luke Maurokefalidis Kostas Tsartsaris and Lazarus Agadakos. The camp will be honored by the presence of a leading Greek coach Vangelis Alexandris. For the Lilliputian basketball players there will be gifts and surprises. See here the triptych with the entry form.